This library implements rendering of popup box with “Clippy, the paper clip”. You can make him say various things by calling clippy-say function. To hide the pop-up, simply invoke any command (move forward/backward, type, C-g etc., any event is recognized). By default Clippy show tip using pos-tip. you may prefer using popup. As inspiration, two functions are provided: clippy-describe-function and clippy-describe-variable. Bind any of these functions to a key, then while point is over a function/variable, call it. A popup with helpfull clippy will appear, telling you about the function/variable (using describe-function and describe-variable respectively). This package depends on pos-tip or popup. 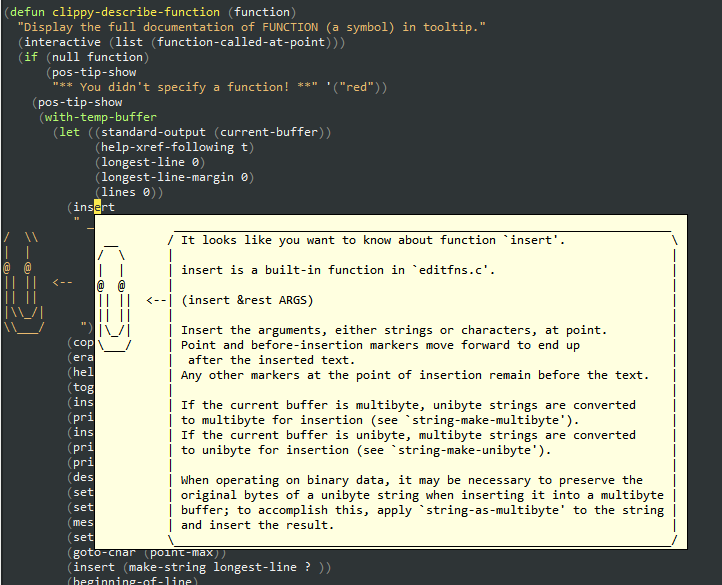 The inspiration to write this package came from http://www.geekzone.co.nz/foobar/5656, a crazy discussion on #emacs and my terrible headache stopping me from doing anything more productive.